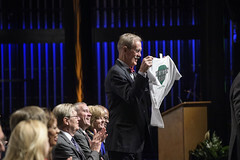 July 7, 2019 marks the formal beginning of your medical education at Wright State University. 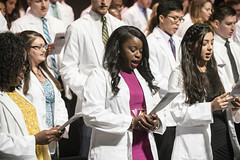 Surrounded by family and friends in the spectacular Schuster Center, new students will receive the symbol of their chosen profession — the white coat — and take their first oath of professional medical ethics at the Convocation and White Coat Ceremony. The event kicks off Orientation Week. 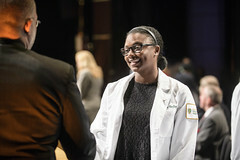 Members of the Class of 2023 will check in at 11:30 a.m. in the Winter Garden staging area for picture taking and refreshments provided by the Boonshoft School of Medicine Alumni Association. 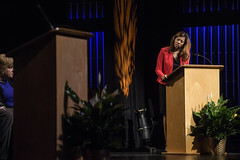 At the same time, family members and guests are invited to attend an orientation program in the Mead Theatre. After a brief welcome and short video, key school administrators will meet with your family in an informal question-and-answer session about what to expect during your first year of medical school. There is no limit on the number of guests you may invite. The official ceremony begins at 2 p.m. Entering medical school is the start of your career as a physician in the profession of medicine. During your medical education, we will emphasize the professional attributes and core values that should be present in the learning environment and manifested by our students. In keeping with the school's emphasis on professionalism, the Medical School Student Council has adopted an Honor Code at Boonshoft School of Medicine. Written by medical students, this Code outlines the characteristics deemed necessary for the development of compassionate and responsible physicians. 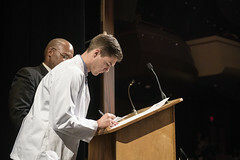 As part of the Convocation and White Coat Ceremony, all students will sign the Medical Student Professional Honor Code. As the professional behavior described in the Honor Code is expected of all students, it is important for you, as a new member of this community, to commit yourself to these standards. Please take time to read and reflect on it before Convocation. The first day of Orientation is on the Friday before Convocation. The 2019 Orientation Schedule and Class of 2023 Checklist will be available soon. New students and their families are invited to campus for tours in the morning with an ice cream social that evening. Orientation continues the following week. Parking will be available all week in Lot 16, in front of the Gandhi Medical Education Center, also known as White Hall or the Boonshoft School of Medicine building. A highlight of Orientation Week will be a day of team building on the Wright State Challenge Course, featuring an outdoor climbing and rappelling tower and a low ropes course. You'll also learn about dual-degree programs, volunteer opportunities and medical student clubs and organizations you can join. This week will include an introduction to our innovative teaching style, the WrightCurriculum. Your transition into medical school is very important to us. If there is anything we can do to help make it easier, please let us know by contacting Admissions at (937) 775-3762 or emailing us at som_admissions@wright.edu. The class of 2020 took an excursion to Glen Helen in Yellow Springs during Orientation Week.